Bone Cancer, Second Edition comprehensively investigates key discoveries in the field of bone biology over the last five years that have led to the development of entirely new areas for investigation, such as therapies which combine surgery and biological approaches. 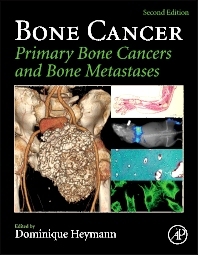 The Second Edition expands on the original overview of bone cancer development (physiology and pathophysiology), with key chapters from the first edition, and offers numerous new chapters describing the new concepts of bone cancer biology and therapy, for both primary bone tumors as well as bone metastases. Each chapter has been written by internationally recognized specialists on the bone cancer microenvironment, bone metastases, osteoclast biology in bone cancer, proteomics, bone niche, circulating tumor cells, and clinical trials. Given the global prevalence of breast and prostate cancers, knowledge of bone biology has become essential for everyone within the medical and cancer research communities. Bone Cancer continues to offer the only translational reference to cover all aspects of primary bone cancer and bone metastases – from bench to bedside: development (cellular and molecular mechanisms), genomic and proteomic analyses, clinical analyses (histopathology, imaging, pain monitoring), as well as new therapeutic approaches and clinical trials for primary bone tumors and bone metastases. Bone biologists, cancer researchers, oncologists, orthopedic surgeons, radiologists and other specialists in cancer imaging; Medical libraries; graduate academic libraries. 11. Technical aspects: how do we best prepare bone samples for proper histological analysis? 25. Margins and bone tumors – what are we talking about? Dominique Heymann studied cell biology, biochemistry and immunology in INSERM (French NIH) unit 211 at the University of Nantes and received his Ph.D. in 1995. He was appointed Associate Professor in 2001 in the Department of Histology and Embryology. In 2009, he was awarded a personal Chair of Histology and Embryology. Currently he is the Quality Control Manager of the Tissue Bank and Gene and Cellular Therapy Unit at Nantes Hospital. He heads a laboratory research group (INSERM UMR 957) of 65 people at the Faculty of Medicine, where the pathogenesis of primary bone tumours, and more specifically, the role of bone microenvironment (osteoclasts, mesenchymal stem cells, OPG/RANK/RANKL, IL-6 and MCSF cytokine family) in tumour growth is studied. In 2006, Dominique Heymann won the Paul Mathieu prize from the National Academy of Medicine for his work entitled “From the osteolytic process associated to primary bone tumors to the development of bi-therapies for osteosarcoma”. He was on the national scientific advisory board of INSERM (2008-2012) and is now Co-Chairman of INSERM scientific commission n°5 (“Physiology and pathophysiology of endocrine, bone, skin and gastrointestinal tissues”). He has authored approximately 180 publications in peer- reviewed journals, more than 300 abstracts and 20 book chapters. He is also Associate Editor of Life Sciences, Academic Editor of PLoS ONE, Editor-in-Chief of the Open Bone Journal and serves on the Editorial Board of Current Medicine Chemistry, European Journal of Pharmacology, and Journal of Bone Oncology.